The Rascal Flatts bio is the story of a group that has achieved crossover success in both the country and rock worlds. The band is one of the most recognized names in the "chart country" genre and has won over legions of fans who thought they hated country music. Although their rise to fame happened in Nashville, Tennessee, Rascal Flatts was actually founded in Columbus, Ohio - hometown of two of the band members. Jay DeMarcus, bass player, made the decision to start the band, but recruiting fellow members was a different story. He knew he wanted his cousin, Gary LeVox, to take the mic for the band, but LeVox was hesitant to give up a good job working for the Ohio Department of Mental Retardation and Developmental Disabilities and take a chance on a music career. Eventually, the founding member of Rascal Flatts convinced LeVox to go for it, and the two moved to Nashville, the place to be if you want to kick off a career in mainstream country music. Once in Nashville, although they continued to work on their own band, the two joined in other musical pursuits to pay the bills. DeMarcus landed a record deal with a band he had begun playing with, Christian rock band East to West, but that soon fizzled out. He then joined the band for country chart topper Chely Wright. In addition to his work with Chely Wright, DeMarcus was playing a standing gig with LeVox in a nightclub in Nashville's famed Printer's Alley. One night, their guitar player couldn't make the show, and they asked Joe Don Williams, who played with DeMarcus in Chely Wright's group, to stand in. The rest is Rascal Flatts history. The three began working together on landing a record deal, and by 1999, they did just that. Lyric Street Records, a subsidiary of Disney Music Group, signed the band at the end of 1999, and they did not waste any time getting a record out. By early 2000, Rascal Flatts released their self titled debut CD. The first single, Praying for Daylight, went straight to number three on the Billboard country charts, and the hits did not stop there. They released three more singles from this album - This Everyday Love, While You Loved Me, and I'm Moving On - and all of them made it into the top ten of the country charts. Their sophomore album, Melt, brought greater success and some controversy. The song produced another four singles, all top ten, including two number ones. Mayberry and These Days both hit the number one spot on the country charts. Their single I Melt, which went to number two, came along with a video that offended many in the often conservative country music fan based. The video that showed Joe Don Williams naked from the back and the silhouette of a woman taking a shower. It was banned by the Great American Country channel, but Country Music Television decided to run with it. The video was voted to the number two spot by viewers. The hits on the country charts kept on coming with Rascal Flatts' next two albums, Feels Like Today and Me and My Gang. Feels Like Today spawned the single Bless The Broken Road, a cover track which spent five weeks at number one. Following Me and My Gang, Rascal Flatts recorded a cover of the song Life is a Highway for the movie Cars. The song was never released as a single, but radio stations picked up on it and managed to send the song up to number 18. 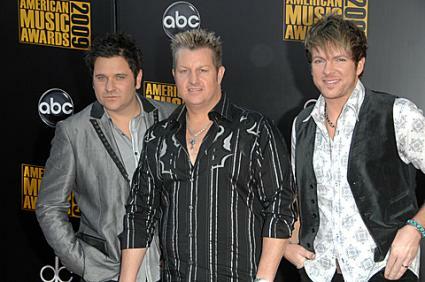 By the end of the 2000s, Rascal Flatts had released three more albums, including a greatest hits compilation. Each album produced a top ten hit. In 2009, Rascal Flatts released Unstoppable, in partnership with JC Penney. A special version of the album was made available exclusively through JC Penney, who agreed to sponsor the band's tour in support of Unstoppable. JC Penney donates a dollar from every sale to their JC Penney Afterschool Fund charity.